Hello! I am in the middle of composing a mass based on Veni, Veni, Emmanuel. I’m familiar with Proulx’s ‘Missa Emmanuel’ but I wanted to do something different. I am getting hung up on the Sanctus with the text not fitting quite how I like. I am wondering if it is licit to change the text slightly from, “blessed is he who comes in the name of the Lord,” to, “blessed is he who comes in your name.” I don’t prefer to do this. But if it’s acceptable, it may be my only option. Words or phrases may be repeated, within reason, but not removed/exchanged in the manner you say. If you are willing to post a pdf of what you have so far, some members may be able to give you some suggestions for getting out of your compositional predicament. This is a photo of what I have composed thus far. The best I could come up with is setting some of the text to 8th notes abd I feel that it interrupts the flow of the tune too much. But I can’t seem to make it fit any other way! Any ideas? The USCCB probably would not approve publication or use of a setting that has text modifications, other than the use of repetition, so it will be necessary to resolve diffficulties while preserving the authorized text. Thank you for your concern. I'm no longer looking to change the text. I am looking for some way to use the text, without disrupting the overall flow of the tune itself. I'd like it to fit to the original rhythmic feel as much as possible. I attached a picture of my sketch a few comments above. I would love any creative feedback or ideas on how to accomplish this. Bringing together "Blessed is He who comes in the name of the Lord" with the tune of "Rejoice, rejoice! Emmanuel..." does require you to bend the rhythm of one or the other -- or both! As it is marked above, the tenuto mark on "Blessed" will tempt singers to accent the second syllable, which will probably sound artificial. Perhaps it would help to drop that mark. This is the only thing that comes to mind. It seems a bit awkward, but does respect the original rhythm. This also allows you to avoid, if you wish, the introduction of eighth notes in what otherwise reads as plainchant. A quick breath between Lord ' Hosanna will convey the textual meaning. The biggest downfall would seem to be in shorting Hosanna its melisma, which it seems to beg for! If you wanted, you could drop the dot on "Name" and carry the phrase straight through, as some interpretations of Veni Veni Emmanuel carry through from Emmanuel to Nascetur with a "non-dotted" punctum on the "el" of Emmanuel. It is a bit tricky to meld these two, and this may not be what you're going for. But it's something to consider. 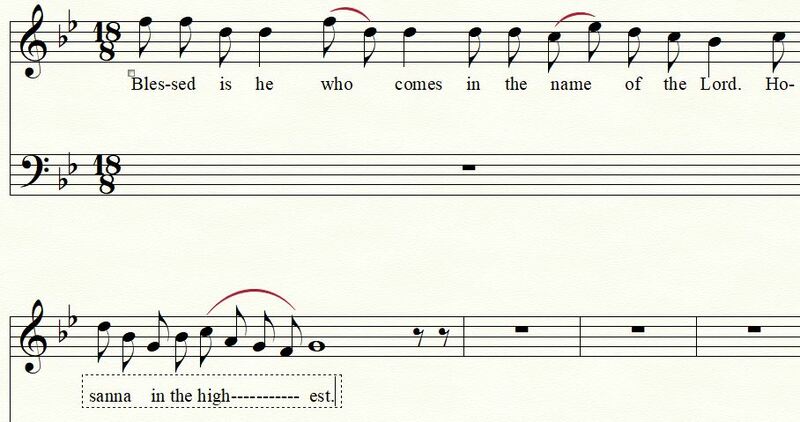 I don't have the technical ability to upload it right now, but my suggestion would be to prolong the word "comes" (6 notes, total) , during the Benedictus, so that you begin "in" on the D, two notes each : "In- the- name" and then one note "of the Lord". Then you could use a repeated "hosanna", thusly: Hosanna, Hosanna, Hosanna in excel------sis. All this said, I don't think this sort of Mass, based so straightforwardly on a well-known hymn tune, works well in general. These parody masses seem to be more popular than they merit being. But, then, isn't that true of most things that are 'popular'? Why would one wish to add to their number? It's a pity that Proulx had nothing better to do with the fifteen minutes it probably took him to conjure up his 'Missa Emmanuel'. A bad example for others. A genre which ought not to be emulated - which ought to be proscribed. Would you accept, in principle, that Masses could use already written tunes, so long as - in doing so- they made compositions worthy of the dignity of the Mass. I had started to write '...which ought to be proscribed - unless one is a Josquin des Pres or a Bach'. As in all things, it is the quality of the craft which determines the musical and artistic value. Lacking such substantive value, one is left with what is essentially, objectively and subjectively, mere entertainment. And, in answer to willschill's question - one cannot alter by one iota the official ritual text. Ignore time signature, repeat first motive once and finish. This (the idea of chanting the entire Ordinary to one hymn tune) seems like a perfect way to make pips less excited to finally sing "Veni, Veni, Emmanuel." It's sort of like the monotony of the "Mass of the Patriarchs," but also ruins a hymn. If we use the melody for Veni Emmanuel in a parody Mass, those who want their fix of this hymn can have it, and those of us who want to use the proper Magnificat antiphon melody for the original texts can introduce it. Thank you to all who have commented and helped me in my composition (although I see it as more of a setting.) I might offer a bit of background information to those of you who seem less enthused about it. I completely agree with the “naysayers” (if you’ll forgive the colloquialism). I am not thrilled by the use of this and would much rather use something more traditional. But I am directing music for a parish that is widely set in very unorthodox ways. As a parish in the Midwest, we are surrounded by a surplus of Lutheran churches that widely influence the culture of the city and the parishes. My task and goal is to move away from this, back to music and liturgy more traditional. This exercise is simply a way to get my parish and my choir (most importantly the parish) comfortable and used to chant. Being based on the O Antiphons and having a strong dislike for Proulx’s composition I elected to produce my own with the intent on holding as much as possible to the rhythm and overall musicality of plainchant and antiphonal works. This isn’t something I plan on using much in the future. I’m simply using it as a hopeful stepping stone in the process of moving a congregation back to the beauty and reverence found in sacred and traditional works. Again, thank you all for you help and concern! Be careful that you don't accidentally set in granite this half-back idea. This isn’t something I plan on using much in the future. Are you familiar with people? This statement sounds like you don't understand how people are. Yes, Adam, I find that odd as well. If it was of no consequence in the first place, why ask for assistance at all? To be honest: if this isn't something you plan on using much in the future, why not just use the English version of the Sanctus from Mass XVIII as found in the Missal, rather than spending time on this? And I think that what Adam is hinting at is that once this (i.e. the 'Veni Emmanuel' Sanctus) is in the repertoire you will be required to use it. "Not doing X much in the future" generally translates into "Doing X repeatedly for the next 10-15 years".